My favorite mechanic from Shadows was (and still is) Investigate. The flavor is sharp, and everyone loves drawing cards, but there’s even more to be done with Clues than just cracking them. For those who’ve never read this column before, welcome! Each week we build an EDH deck around a specific mechanic using the power of EDHREC. Grab your hat and pipe, because this week, we’re doing some investigating! 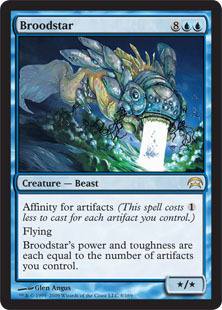 I like to begin my forays into EDHREC with a card that exemplifies the mechanic I’m building around. This need not be a commander, though that’s a great place to start, if possible. Unfortunately, there are no legendary creatures with the Investigate mechanic, so let’s think a little smaller. In my opinion, the best card that Investigates is Tireless Tracker. So here are some options. 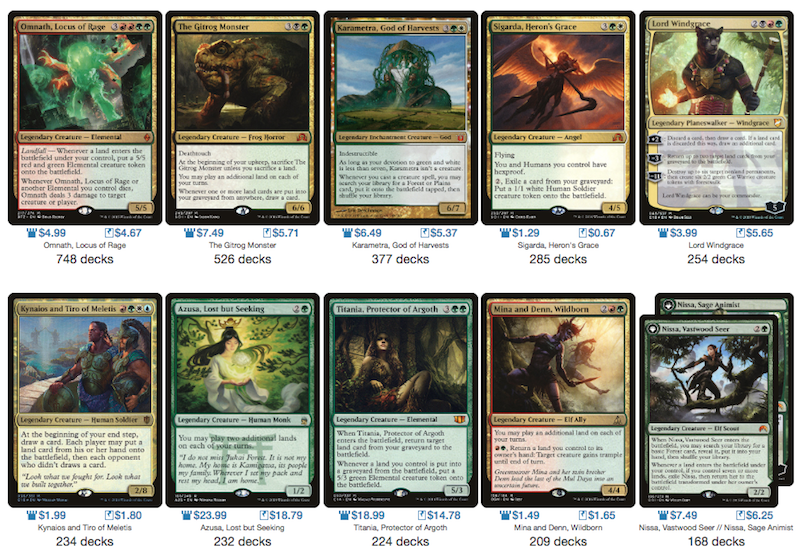 Thinking back on the Investigate mechanic, it’s spread pretty evenly over the Bant colors (blue, green, and white). That focuses our options. On second thought, I like those colors, just not the commander. Kynaios and Tiro are solid, yes, but they do little for our theme. So if we still want to play blue/green/red/white, there’s only one other way to get there. Partners! 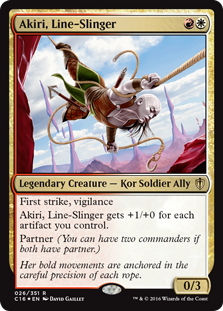 Akiri, Line-Slinger pairs nicely with our mechanic. Each Clue boosts her power, and barring a Vandalblast, they likely won’t be going anywhere. Sweet! That leaves us in need of a blue/green partner commander, of which there are two. The clear choice here, I believe, is Thrasios, Triton Hero. This card is super versatile and fits into essentially any EDH deck: solid early blocker, a nice mana sink, and an excellent card draw/ramp option in the late game. Love it! Okay, now we have our commanders. Where do we go from here? Hopping over to the page for our commanders, we see that there are already a few like-minded deck builders around the internet. Erdwal Illuminator, Bygone Bishop, Confirm Suspicions, Confront the Unknown, Second Harvest, Root Out, Tamiyo’s Journal, Ongoing Investigation, and Ulvenwald Mysteries are all welcome additions to our deck. We could consider Trail of Evidence, but since the average instant/sorcery count of these commanders is just 15, it feels like a long shot. To increase our clue density, we’ll want to add some additional Clue makers that aren’t pictured. I like Drownyard Explorers, Humble the Brute, Thraben Inspector, and Byway Courier. Yes, we’re forced to play junkers to enable our strategy, but I think this should play out as one of those whole-is-greater-than-the-sum-of-its-parts style of decks. The tricky thing about the Investigate mechanic is that it’s limited to just Shadows Over Innistrad. Its companion set, Eldritch Moon, didn’t even have the Investigate ability! That’s certainly a limiting factor. However, we can still find some nice workarounds to support our theme. Brudiclad, Telchor Engineer is an excellent addition from this year’s commander product. The key semantic element on this card is “choose a token.” Not a creature token—any token. 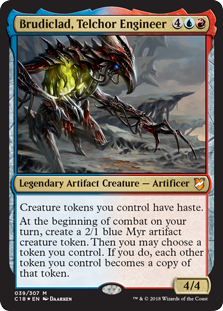 So at the beginning of combat, you create a 2/1 Myr. Then, if you have even one other Clue, you may select it as your token and convert your Myr (and any other tokens you own) into Clues. Somebody give this guy a Sherlock Holmes hat. Brudiclad’s commander page is also helpful for finding additional Clue makers. Mechanized Production, for instance, creates an additional Clue every turn. It can even act as a win condition if no one deals with it! Drawing copious amounts of cards is fun and all, but we should probably solve our case at some point. 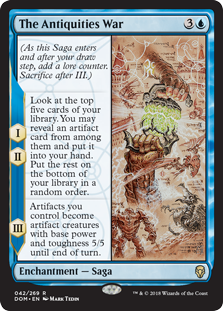 Besides Akiri acting as a legitimate threat with lots of Clues on the board, there are many other cards in the history of Magic that interact favorably with batches of artifacts. Let’s start with some recent ones. 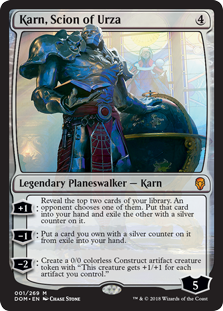 Karn, Scion of Urza will be one of the best cards in the deck (if you can swing his price tag). His -2 ability dumps out mini Akiris. 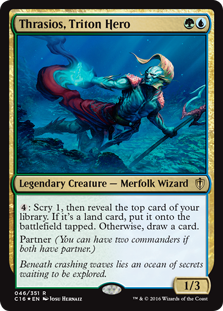 I also love that he’s a colorless card in our four color deck, meaning mana will never be an issue when casting him. And hey, the card drawing can’t hurt either. 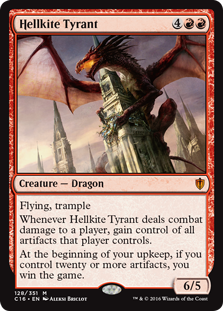 It’s unlikely that Hellkite Tyrant will win you the game, but I love the upside. 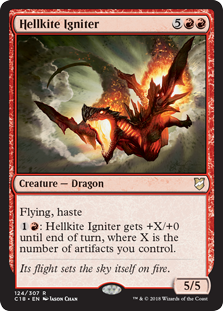 At worst, this is a six-mana 6/5 with flample that steals opposing artifacts. A must-have for this deck. Okay, its base stats aren’t all that impressive. The 5/5 body feels a little underwhelming for seven mana, even considering the flying and trample. But if you untap with the Igniter, you’re going to deal huge amounts of damage. Imagine having five Clues on the battlefield and swinging in for 25. I like the sound of that! 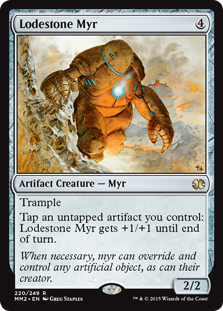 Lodestone Myr is a nice payoff for all the artifacts we’re generating. 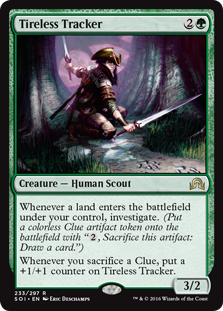 What I like best about this card is that you need not sacrifice the Clues (or other artifacts) to use its ability. The synergies are obvious with this one. You should often cast Broodstar for two or three mana, getting an 8/8 or a 7/7 with flying. Also, if you generate more Clues, its power and toughness will rise accordingly. 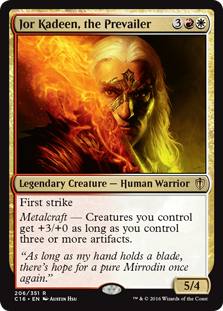 Metalcraft is an excellent mechanic to pair with Investigate, and there might be no better payoff than Jor Kadeen, the Prevailer. +3/+0 to all your creatures is great. At that point, almost all your creatures will trade up, or maybe even just trump your opponents’ creatures. Furthermore, he grants the bonus to himself, too. Eight power with first strike is a nasty combination – ust ask Akiri. This one is on the line for me, so I’d appreciate getting readers’ thoughts on it. Funnily enough, we don’t have all that many pure artifacts in the deck—the total count is about 30. Thus, Chapters I and II aren’t really the best draw. We’re playing it for Chapter III. With enough Clues, that final Chapter could become a game-winning play. I like swinging in for a thirty or forty damage to end the game. However, the card’s relative slowness concerns me. Have others had success with this card? Please let me know! This seems like a fun deck. I’m looking forward to playing it. I’ll let you know how it does, and let me know your thoughts below!